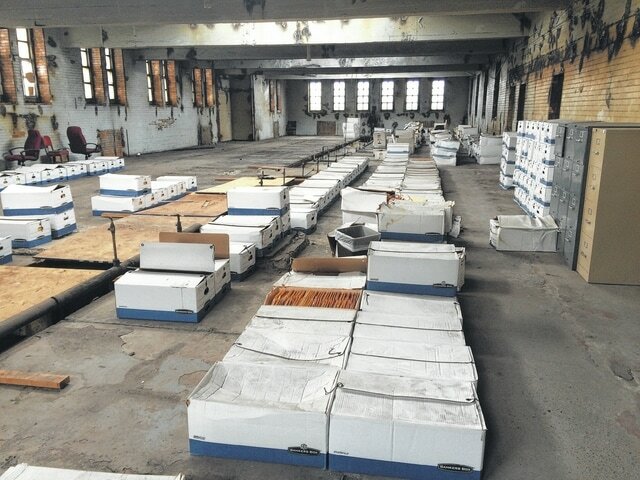 Some of the records being stored on the fourth floor of the Scioto County Courthouse. At one point in the not so distant past, the Scioto County Commissioners were scrambling to find enough space for offices, inside and outside the courthouse. Now the commissioners find themselves with unused space, and they are looking to use the space strategically to meet long-term need of the county. With the recent purchase of the courthouse annex, some additional space has opened up. The county’s purchase price was $956,022. As a part of the purchase agreement the previous owner of the annex, agreed to replace the roof and gutters on the building. Scioto County Commissioner Bryan Davis said the county had a safety audit done on the building. He said the audit pointed out some things that could be done to enhance the building. Davis said things identified in the audit will need to be taken care of before the commissioners would consider relocating a county office to the annex. County offices currently housed in the annex include Scioto County Prosecutor, Fourth District Court of Appeals Judge Matt McFarland and Scioto County Veterans Services. Davis said there is one full suite and a half of a suite available. “We plan to have those filled, but right now we plan to take care of some of these issues first before we put someone in there,” Davis said. He acknowledged the commissioners are sitting on that space as well as some space in courthouse. Davis said the commissioners have to look beyond temporary needs of offices to meet the long-term needs of the county. In 2013 the remains of the former Scioto County Jail was removed from the fourth floor of the Scioto County Courthouse. Since the removal of 300,000 pounds of steel, the fourth floor has become a storage space for records and documents. If the commissioners were to attempt to utilize the space they would have to find additional space to store the records. “With the issues with record keeping and some of the offices are looking for more space, we need to the strategic in what we do and taking more time when we make decisions on moves,” Davis said. Davis said the long-term goal of the commissioners would be to renovate the fourth floor and make it available to use. Portsmouth Municipal Judges have expressed interest in moving from the Portsmouth Municipal Building to the Scioto County Courthouse. “We are missing out on a huge opportunity, by not utilizing the fourth floor. That is real estate we already own. As soon we can we need to renovate that space,” Davis said. Davis said the commissioners are currently seeking money to renovate the space. He said even if grant money is not available, the county needs to develop a plan to do it on their own. Davis said the needs of each of the offices are being considered by the commissioners. “We’re looking at everything, trying to figure out the best path forward to make sure we don’t make a bad decision,” Davis said.